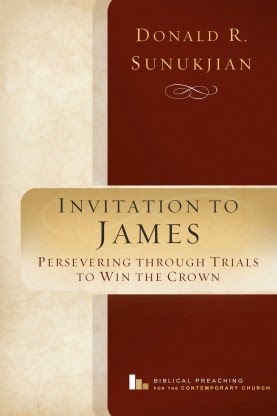 Donald R. Sunukjian, Invitation to James: Persevering through Trials to Win the Crown, Biblical Preaching for the Contemporary Church (Wooster, OH: Weaver, 2014). Invitation to James is a collection of fourteen messages on the book of James. The author, Don Sunukjian, has written the award-winning Invitation to Biblical Preaching and has taught homiletics for many years. This work is part of a projected six volume series (Biblical Preaching for the Contemporary Church). “The purpose of this series is to offer models of the principles presented in the textbook” (p. xi). The fourteen messages are slightly-edited versions of actual sermons preached by the author. Most of the messages run about ten pages. Sunukjian includes a brief introduction to James. In the introduction, he suggests that James is writing pastorally (although he does not appear to conclude that James is a homily) on the theme of trials. “James’s purpose is to tell his friends and us how to act both as individuals and as a church, when we find ourselves in stressful and difficult situations” (p. 3). This volume provides solid examples of expository messages. Each message attempts to deal with the main points of the text through explanation and illustration. The illustrations in particular are very good. The author also has a nice way of phrasing things. He is clearly a wordsmith. But several aspects of this work would, I believe, add to its usefulness for preachers (the main intended audience). First, outline headings would really help. One would not have to preach the outline, but seeing the outline would help the reader see the flow of the text. I would have preferred a bit more direct application. Second, providing a clearly articulated message (topic and assertion according to Invitation to Preaching) for each preaching passage would make this work more valuable. Seeing how a seasoned preacher crafts such statements would be an education in itself. And third, I would have preferred to see more direct application in these messages. I recognize that this is more a matter of methodological preference, but I would have loved to have seen these principles fleshed out in more concrete and measurable ways. At bottom, Invitation to James will not replace exegetical commentaries, and in fact, would be most effective if consulted after one has done their exegetical work. But if one is looking for a good collection of sermons on James then this volume might just hit the spot. You can access a free PDF excerpt here. Thanks to Weaver for providing the free book used in this unbiased review.